Pictured are: Nicole Kubiaczyk, Andy Barth and Meghan Mattek of Aspirus Langlade Hospital and Richard Ducane of Menominee Regional Public Transit, operators of Red Robin Transit. 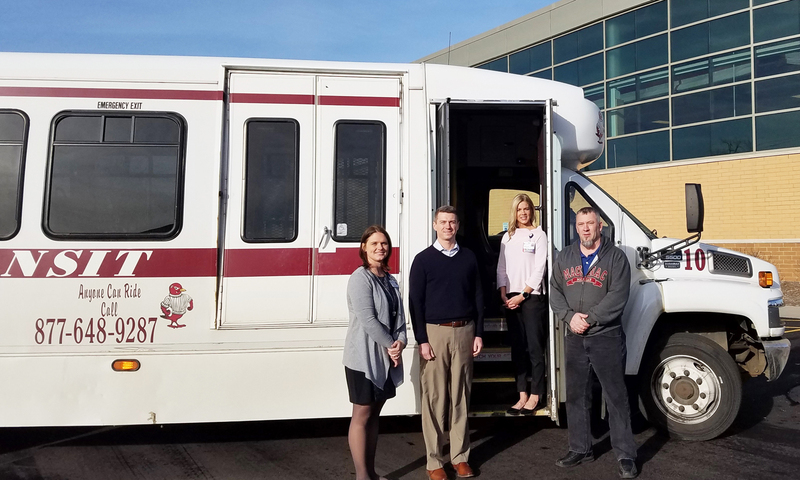 Aspirus Langlade Hospital and Red Robin Transit are pleased to announce details regarding expanded public transportation services to residents in Langlade County. The Community Health Needs Assessments conducted in 2013 and 2016 both identified transportation as one of the greatest difficulties in accessing health care services in Langlade County. As a result, a team was established at Aspirus Langlade Hospital to determine options to positively impact this issue in the community. An assessment was conducted to understand the current state of public transportation and found affordable public transportation services with convenient hours were limited in our community. Red Robin Transit provided the only public transportation services in the City of Antigo and within an 8-mile radius of the City. Service opportunities were restricted by Red Robin Transit due to budget limitations. In April 2017 funding was approved through Aspirus Langlade Hospital’s sponsored Religious Hospitallers of St. Joseph (RHSJ) Mission Fund Council to strengthen the public transportation services not only in Antigo, but to all 888 square miles of Langlade County through a collaborative agreement with Menominee Regional Public Transit, operators of Red Robin Transit. Two additional routes on the City of Antigo Flexed Route bus service, now operating from 9:15AM until 6:35PM with 18 stops six times daily Monday through Friday throughout the city. One-way fare is reasonably priced at $1.50 – Adult; $1.00 – Senior (over 60)/Disabled; $1.25 – Student. Monthly rates are also available. To learn more about the services offered in Langlade County by Red Robin Transit or to obtain a bus route schedule, purchase bus passes or schedule pick-up through the Reserve a Ride service, contact (844) 89ROBIN or (844) 897-6246 or visit www.mitwbus.com.